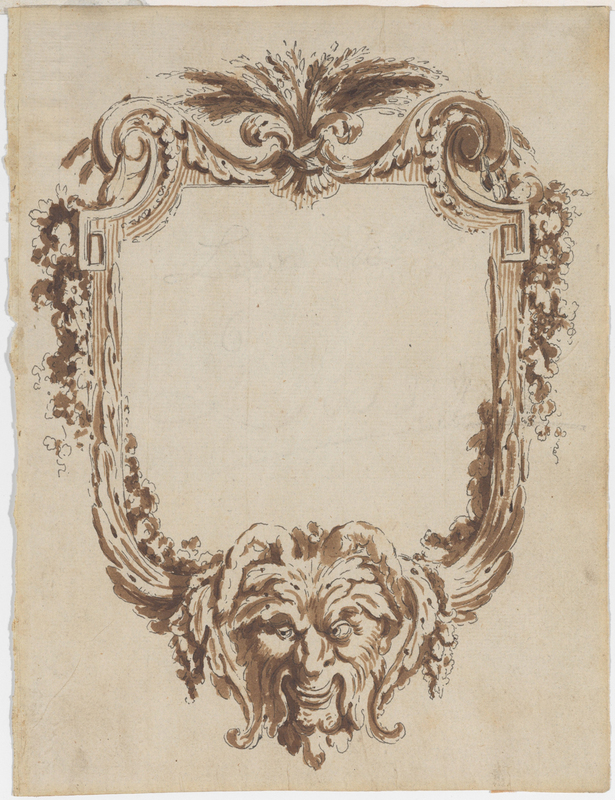 It is rare indeed to come across drawings for frames; these are some of the most ephemeral of designs, since they are often produced either for a framemaker, to be realized in wood and gilding, or they are passed on to an engraver to be converted to an illustration for a pattern book. A trio of these elusive drawings recently came up for auction at Drouot in Paris, and they seem worthy of comment. Jean-Charles Delafosse was born in Paris during the flowering of the Rococo, and lived until NeoClassicism was about to devolve into the Directeur style under Napoleon. His career therefore saw the birth and entire development of the NeoClassical style, from the transitional style of the late 1750s and heavy goût grec of the 1760s to the lighter style (Louis XVI) of the last quarter of the 18th century. He was apprenticed in a sculptor’s workshop, and went on to work as an architect, engraver and ornemaniste, in 1774 becoming a member of the Académie de Saint-Luc . He also produced numerous pattern books and other collections of prints, some of which were intended as serious designs for actual objects, and some of which were fantasies of ornamental choreography – which, however, also fed the evolution of the NeoClassical style. His influence is apparent in many of the buildings and applied arts of the later 18th century – not only in France, but elsewhere in Europe; his most influential work was his Nouvelle iconologie historique (1767-85). 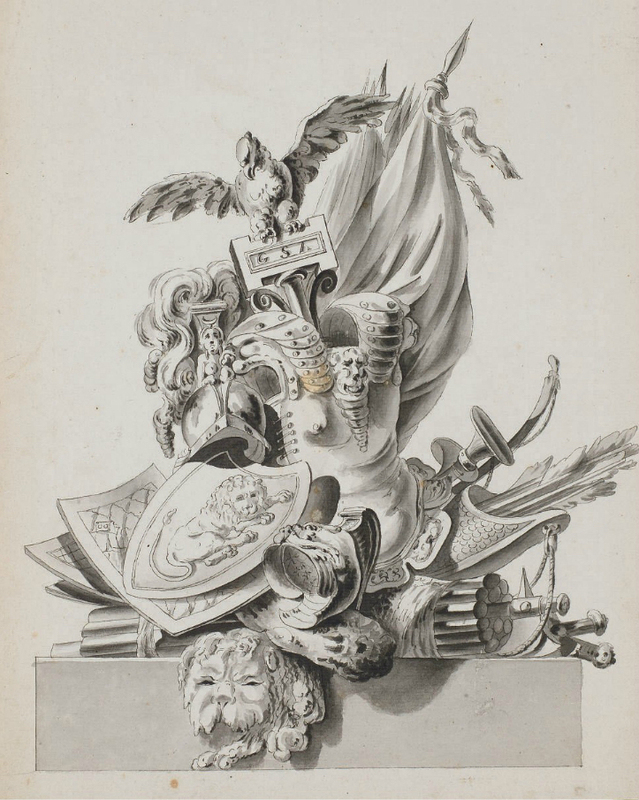 He was influenced himself – like that other father of the goût grec, Louis-Joseph Le Lorrain – by Piranesi, whose drawings he studied, producing a number of drawings of his own which feature classical ruins in Piranesi’s style. 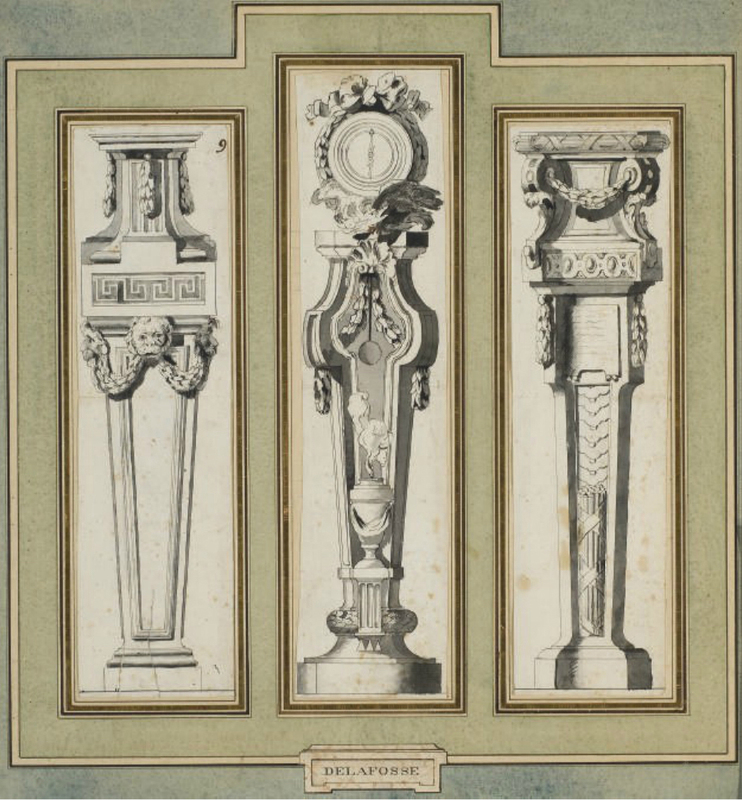 These, like many of his studies of urns and more fantastic artefacts, appear spontaneously sketched and (allowing for the medium of pen-&-ink and wash) ‘can even be considered “painterly”‘ ; his more practical designs, as it were, are meticulously drawn and finished, since these were intended to be engraved. They are exhaustively inventive in the ornaments and motifs used to vary a basic pattern; the tripods above show his command of classical vocabulary in the goût grec. Amongst his designs there are drawings of funerary monuments and trophies – the former sometimes including the latter, and sometimes also including frames, which are shown with detailed ornamental mouldings and motifs, as in the framed portrait of the dead woman on the monument above. 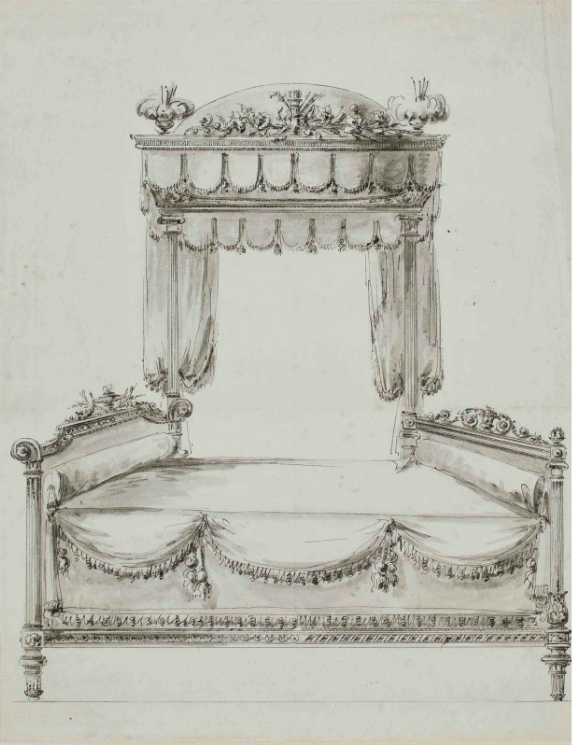 His designs for furniture also include trophies, as in the bed above – where a later, lighter NeoClassical idiom has emerged. The ‘cordes à puits‘ (well ropes, as Charles-Nicholas Cochin christened the heavy swags and garlands of bay leaves in the goût grec, which were used by both Louis-Joseph Le Lorrain and, in the tripods above, by Delafosse) have vanished, and the ornament is subordinated to the form, in a version of the NeoClassical closer to that of the Adam brothers in Britain. 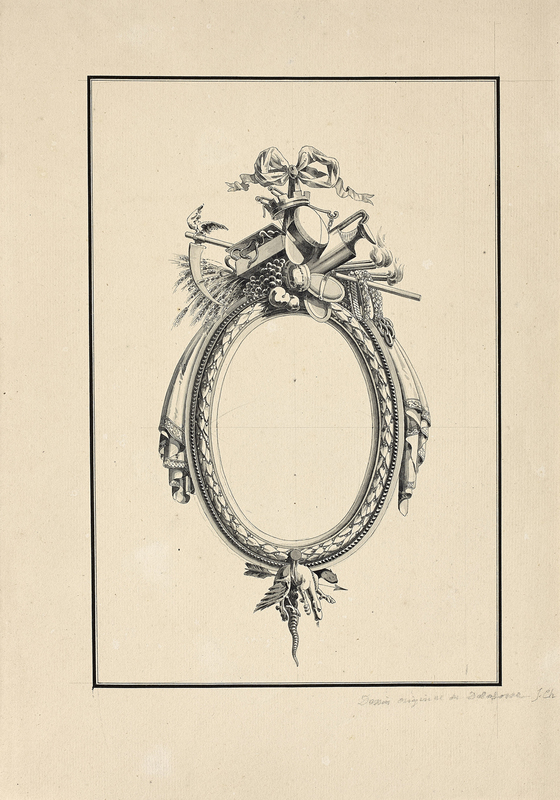 In the light of such an evolving and productive career (which included Delafosse working as professor of perspective and geometry in the Académie de Saint-Luc), the appearance of three of his drawings for frames at auction is particularly interesting. One is an exemplar frame from the pattern book for which these were made; it is immaculately presented, drawn in his favourite combination of Chinese black ink and grey wash. The clean oval of the archetypal NeoClassical portrait frame is there, but it has been enriched and trophied up to the nines, again in Delafosse’s inimitable style. The flat frieze has a garland of bay leaves-&-berries, and the contour of the frame is draped with swags of braided drapery, hanging in sharply-realized folds. A small dead dragon has been skewered with an arrow, and hangs forlornly from a large nail at the bottom of the oval, whilst at the crest an immense trophy, consisting of every imaginable sort of emblem, is heaped up with what might be described as Baroque panache. There are burning torches for love, a classical wine flagon, a crown, a box of snakes, fruit, ears of corn, flowery garlands, and a scythe belonging either to Ceres/Demeter (the wheat and fruit), or possibly to Death. All this depends from a jaunty bow of ribbon. Perhaps it tells the story of Persephone, daughter of Demeter, rapt away by Hades, king of the underworld, to his snake-filled realms, and forced to spend three months of every year there because she had eaten three pomegranate seeds. This doesn’t explain the dragon, unfortunately; but it is actually more likely to be a composite pair of large and small trophies, designed to present several different themes at once to a prospective craftsman or client. 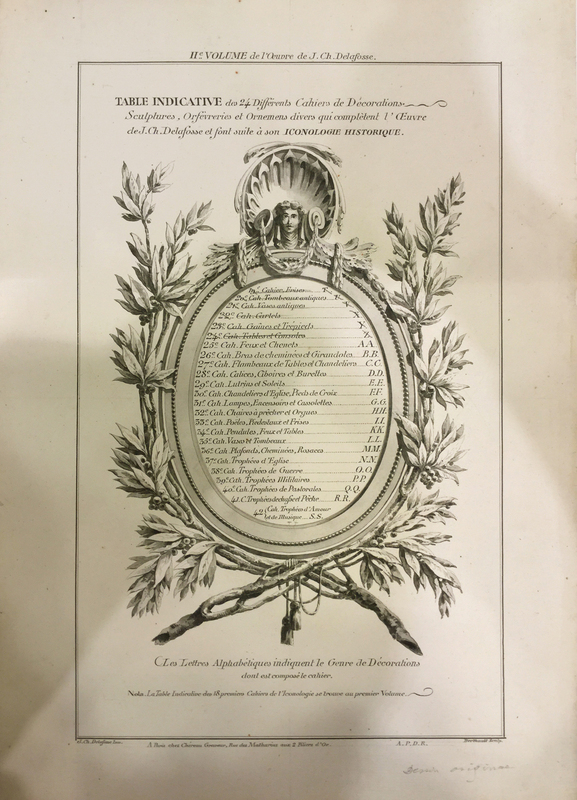 A second drawing shows the table of contents for the Iconologie historique; this is framed in another oval, this time with a running guilloche around the frieze, and a crest from which depend branches of flourishing bay leaves. The crest itself is based on a tête espagnolette – a woman’s head haloed by a ruff or shell – but here it has become a screaming gorgon’s head writhing with snakes. Above is a flowery garland, and the whole depends from a bow of ribbon fastened to a large nail. 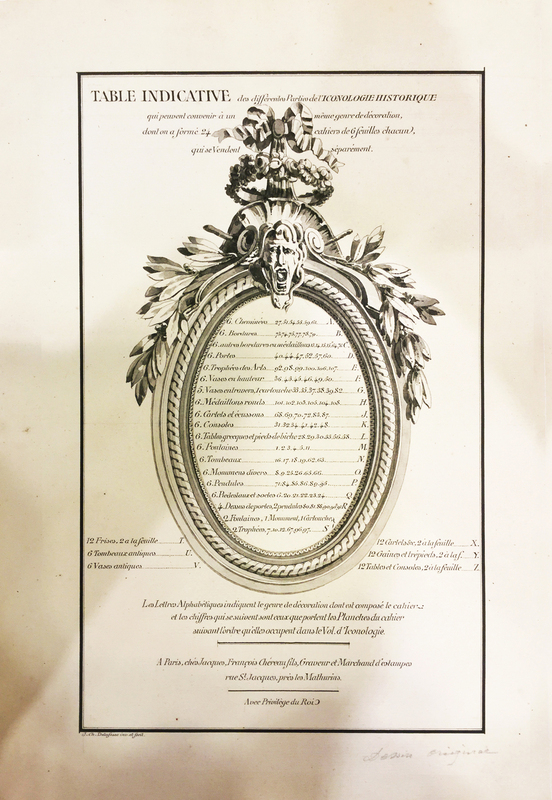 The list of the various classes of design is beautifully set out, within and beneath the frame, and written with exquisite care and uniformity. 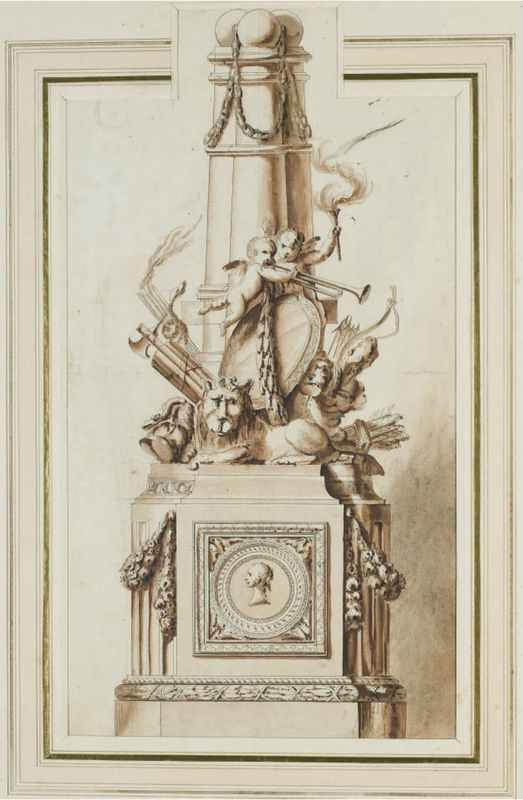 It includes six chimneypieces and twelve frames, at the top of a list of tombs, tables, urns and fountains which sums up fairly succinctly Delafosse’s extraordinary range of invention. The third drawing included in the lot is another table of contents, this time for later designs following after the Iconologie historique. Here there are no frames, but – after the various lighting apparatus, clocks and tombs – there are chimneypieces, ceilings and trophies, all of which are of course closely related to frame design. The framing element of the drawing itself is this time a very plain NeoClassical pattern – an architrave profile, adorned with a simple run of beading. 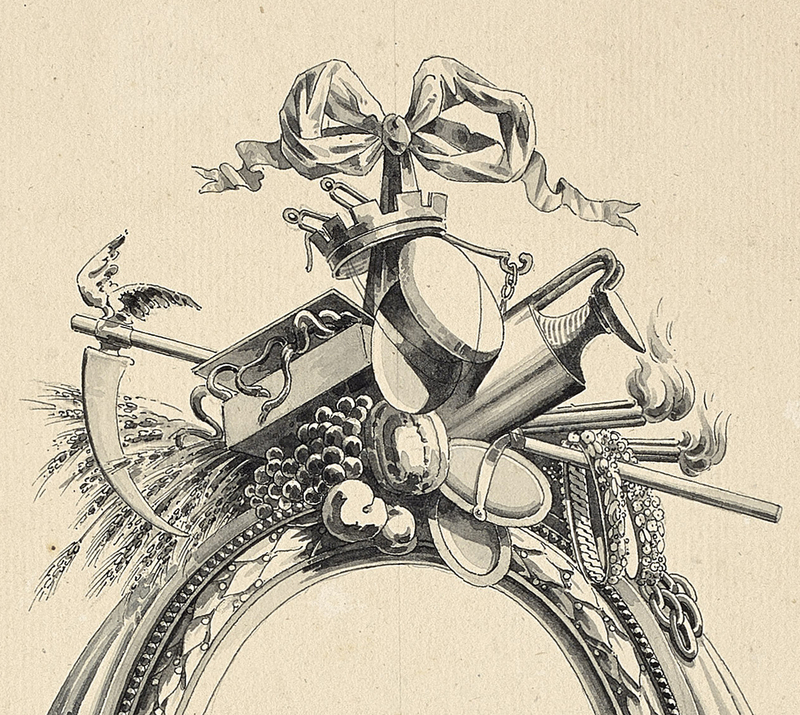 It has more than a crest, however: it is held in two luxuriant branches of bay leaves, tied at the base with tasselled ropes, and surmounted by swagged ‘cordes à puits‘ which support a rather less scary but definitely enigmatic tête espagnolette, held between large volutes like headphones. The drawing in all three designs is meticulous, beautifully conceived and carried out, and evocative on a small scale of the wide-ranging imagination of this inventive and influential designer. It is possible that they have survived together because in the end they were not used for the engraved volumes. It is only surprising that the lot did not sell.